Our journey with Topi took us down what is for some a controversial road -- that of the electronic collar. But the story's happy ending is being illustrated right now. As I write this, the bunnies are running around in the living room doing their fancy jumps and sprints on the same rug on which the dog is sound asleep. So we spent about two months working on the things our trainer suggested and meanwhile we were of course also working on basic obedience and leash training with Topi. The more we worked with her (following mainly the methods of the Monks of New Skete) the more we realized that we were dealing with a very stubborn dog! She is too smart for her own good, and constantly found ways to weasel out of doing what we were asking her to. But with 20 minutes twice a day of training, we slowly began to make some progress on walking nicely on a leash and the sit or down stay. But still Topi would get so excited around the rabbits that we were afraid to let everyone be together. We began to feel that the only way this relationship could work is if we had total voice control of Topi when she was off leash since being on leash around the bunnies clearly made her frustrated. This need for voice control was becoming increasingly obvious because not only was it important for her to listen to us around the rabbits, but she was getting more and more confident on hikes and was occasionally taking off after wildlife (deer and antelope). Our challenge became to teach her to come when called no matter what. In the middle of our feeling like we were working really hard and making slow but steady progress with Topi, we got a chance to go out of town for a month and we were not able to bring the dog or the bunnies with us. So we found a house sitter for the bunnies, but felt sad that the dog would probably forget all her training and slip backwards while we were gone. So we looked around for a "board and train" facility and we found one that seemed to fit our needs and budget and Topi went there for 4 weeks of boot camp! They worked really hard with her on her leash training and the basic obedience stuff and got her to the point where she was excellent on a short leash and on a 15 foot lead with come, stay, heel, etc. We got her home and continued the work, but still felt frustrated with her habit of becoming a crazy noodlehead as soon as a distraction like a squirrel, another dog, or a friend came by. And finally, one day when my husband had just left for work she squeezed out the front door past me and before I could grab her she was running full speed across the street to try to catch up with him. She narrowly missed getting run over. I was screaming her name at the top of my lungs and she just didn't listen. So we decided to try an electronic collar on her and we basically had instant results. We started on the lowest stimulation level (I tested up to a level 20 out of 80 on myself and it feels like touching a doorknob in the winter--a good snap, not pleasant, but not anywhere near real pain.) Luckily, she is so sensitive that we've never had to use a level past 10 and after a couple of snaps at level 10 (out of 80) we now just use the vibrate option which has no shock but makes the collar shake like a cell phone on vibrate mode. Basically using the "snap" in connection with a command helped get it into her thick skull that when we say something important like "Topi Come!" that means she needs to do it or there will be a consequence (and somehow the vibrating collar consequence is enough of a deterrent that she does it.) I'm sure there are plenty of good books that teach how to properly use the electronic collars, so I won't go into details on how our trainer taught us how to use it, but I will say that after one week of using it with her on a long lead where we could practice "come" and "lie down" we had a totally different relationship with Topi. We finally felt that we could trust her to listen to us off leash in a variety of situations even when she wasn't wearing the collar (but we basically made her wear the collar all the time for a couple of months so that she forgot all about it). So after we felt like we had her attention when we needed it, we decided to try rabbit introductions again. We first took her on a long walk and got her both good and tired and in her working mode where she knew she was supposed to be attentive to our commands. We then put her and the rabbits in our kitchen and blocked it off so that everyone had to be in close quarters, but we put our coffee table in one corner so that the rabbits had a safe spot to be under if they wanted to. And finally, we had Topi's collar on and had made a rule that anytime she approached within a foot of the rabbits we told her "No" and if she didn't listen we would give her a "snap" with the collar. Our other rule was that we would reinforce our female rabbit's lunging (she lunges and growls when she feels threatened) with a "snap." The results were pretty amazing. After 2 snaps with the collar at the appropriate times the dog lay down on her bed and enjoyed a treat while the buns hopped around the kitchen. After only a few minutes of Topi being calm, the buns approached her for a few sniffs and then retreated to their area under the table. We let everyone hang out for about 30 minutes and then called it quits. I did this every night for about a week. After that week, we started giving the buns and the dog free rein in other parts of the house where the bunnies were used to being, so that they knew the places to hide if they were feeling freaked out. I only a couple of times had to zap Topi with her collar because she was getting overly excited, and this was mainly because the rabbits were feeling so relaxed about the dog at this point that they were starting to run around and do their running and jumping displays, and that was very hard for the dog not to be excited about. But I guess about two weeks after the initial re-introduction in the kitchen, after a 20 or 30 minute supervised session, the dog started to really ignore the rabbits almost completely. She still tries to sniff them and steal their treats from time to time, but a growl from Magpie or a "no" from me will get her to leave them alone. We've now gotten to the point where the bunnies and the dog all hang out together for several hours each day, even when I'm not home or am home but am in a different part of the house. So I feel at this point that we have a real success story! Crow and Magpie just celebrated their 6th birthdays and the dog is 2, so hopefully we'll have several more years of peaceful interaction. I hope that our story is helpful to some of your readers. It's a scary process, but I think that with the right dog it can surely work. Thank you so much for this blog! I currently have a 1 year old Netherland Dwarf rabbit named Toby who I adore -- however, my boyfriend and I are currently in the process of buying our first house and would like to bring home a puppy in a few months once we're settled in. I've been doing a lot of searching on the web about how dog/rabbit interaction and how best to introduce the two animals to each other. I have a couple pretty good articles, but there's nothing better I find than some first-hand accounts of people who've actually gone through the process. If this blog is still going in a few months time, I would very much consider volunteering our own story with the eventual bunny/dog introductions. I stumbled upon your blog postings and am quite amazed. 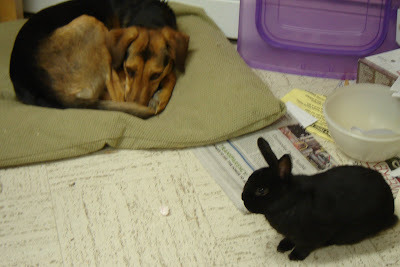 I never would think that dogs and bunnies can live in harmony, you're proving us naysayers wrong! I enjoy your writing style and look forward to hearing updates on the progress. I'm also in the process of adding quality rabbit blogs to my website and I would love to add yours, please email me! You're welcome to link to Dog Meets Bunny. Thanks!